Recognition Climbers framed desktop print image: Against a dramatic, fiery sunset, a climber, having reached the summit, offers a helping hand to her partner, assisting him to the top. 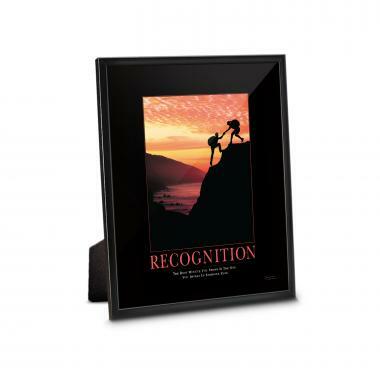 Jump-start each day with a 5"x7" Recognition Climbers framed desktop print in every work area. This easel-backed framed desktop print reinforces business values and offers daily inspiration.